Shrimp happens all over the Alabama Gulf Coast. In last week’s blog, we described an award-winning shrimp dish prepared by Spectrum Resorts’ very own Executive Chef, Brody Olive. Now, we are in the kitchen with Chef Olive and he is teaching us the Brody way to create succulent Shrimp Linguine. “Seafood is my bag. I love it,” says Chef Olive who is a professionally trained Chef that loves to cook and create dishes that spotlight fresh coastal seafood and farm-to-table vegetables and fruit. Living on the Alabama Gulf Coast allows him the opportunity to experiment and experience the best of both worlds. 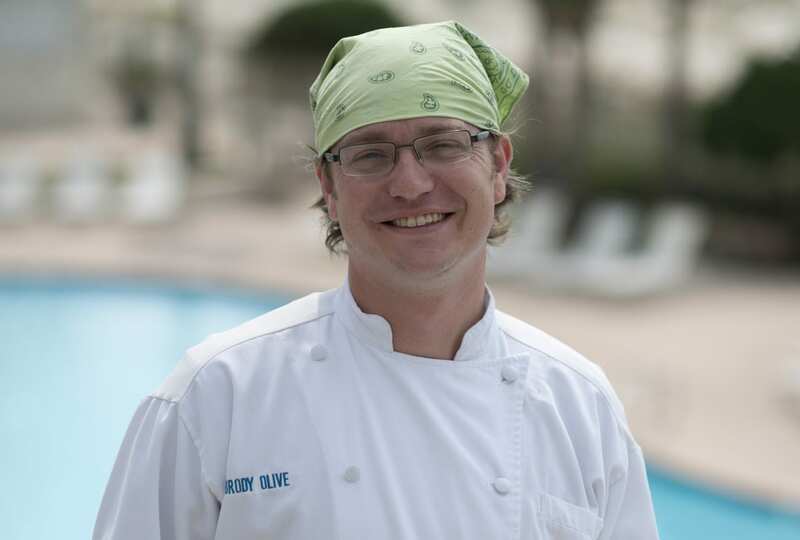 Born in Birmingham, Alabama, and raised just south of Atlanta, Georgia, Chef Olive attended Johnson and Wales University, where he learned the culinary fundamentals. He began his career at Ocean Restaurant in Birmingham as the Sous Chef, learning under the owner and well known Chef George Reis. Ocean achieved many honors during Brody’s tenure including the AAA Four Diamond Award, Five Stars by Birmingham News to name a few. He won the Southern Breeze Gulf Coast Cook Off in 2008 and Zatarain’s Annual National Shrimp Festival Restaurant Challenge in 2009 and 2013. Brody also won the Wine Spectator Award in 2009, 2010 and 2011. Chef Olive’s focus has always been on seafood. It’s not every day you dine out and experience such a succulent entrée like Shrimp Linguine. But now, you can have the help from Chef Olive with step-by-step instructions on how to make it the Brody way at home or on vacation! Follow the link below to watch Chef Olive creating his famous Shrimp Linguine or follow the recipe below to create this dish in your own kitchen. Please comment and let us know a recipe you would like Chef Olive to feature from the Coast Restaurant menu. Peel and devein shrimp. Season with salt and pepper. In sauté pan over medium heat, add shrimp, garlic, Roasted Tomatoes or Peppers (Your Preference) and sautee for 2 mins. Remove pan from the heat add white wine, heavy cream, 2 Tablespoons of basil pesto return to heat and reduce by half. Stir in 1/2 the Parmesan and serve over linguine garnish with finely diced bell peppers and remaining parmesan. Combine basil, garlic pine nuts in food processor. Pulse until coarsely chopped. Add 1/2 cup olive oil and process until fully incorporated and smooth. Season with salt and pepper. Add remaining olive oil. Blend until smooth. Stir in Cheese.